Sure, the company may be going belly-up, but that doesn't mean you can't still pop a cold one. 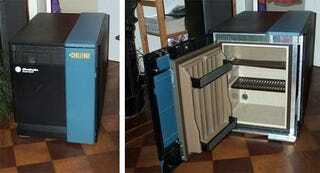 This case mod melds the best of two worlds—antiquated high-end computing and mini-fridges. This Challenge DM workstation gave up the ghost and some students in Amsterdam decided to stuff a hotel fridge inside it. The result is a perfect marriage of form and function. Old tech never dies. It just gets repurposed.